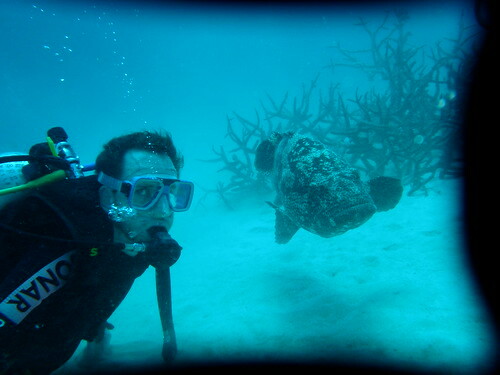 It's one of the world's most famous dive sites but I was fairly ambivalent about the Great Barrier Reef. I'd heard so many stories from people who said it had been over-dived and the beauty of the reef had been spoiled due to inconsiderate divers walking all over the coral. 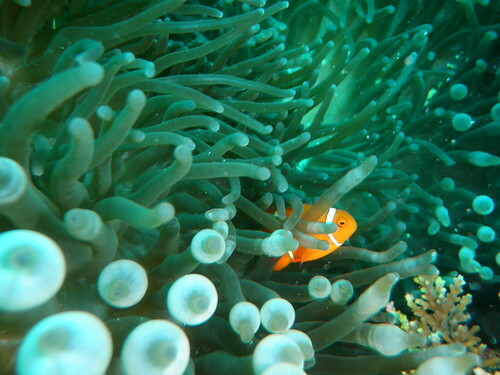 However, Port Douglas was less visited than Cairns by divers (the latter is the biggest distributor of PADI certificates in the world, followed by Koh Tao), so is probably the best chance you have to see undamaged reef. We paid $250 for 3 dives for the day (a far cry from the bargainous dive shops in SE Asia) and jumped on board the Poseidon, the boat that Tom works on. 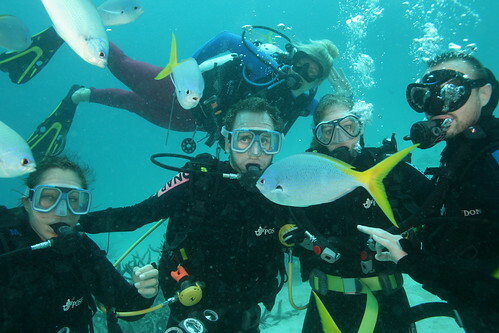 Erin was our instructor for the day, so the five of us made a perfect small dive group. 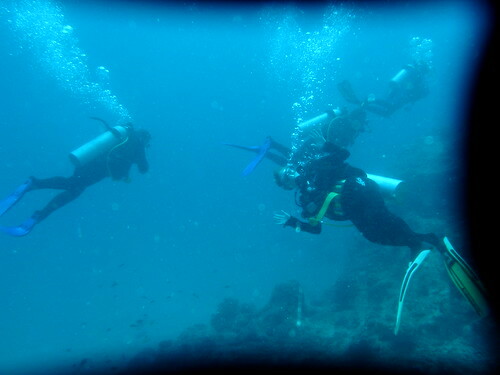 Our first dive site was Totem. 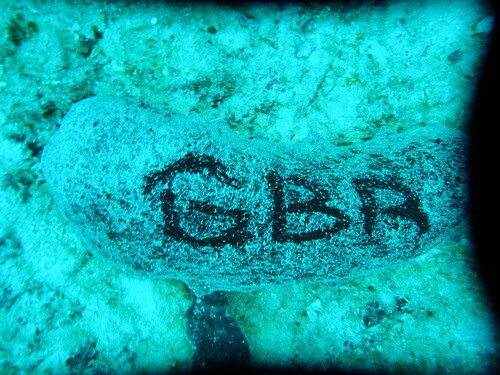 Not the most exciting dive, it was fairly bleached, with lots of broken coral. 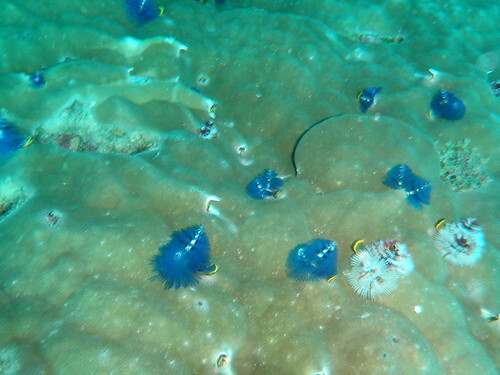 We saw some maori wrasse and lots of clams, as well as a nudibranch (Notradamus Minor according to the book). Castle Rock was next, and was much better. 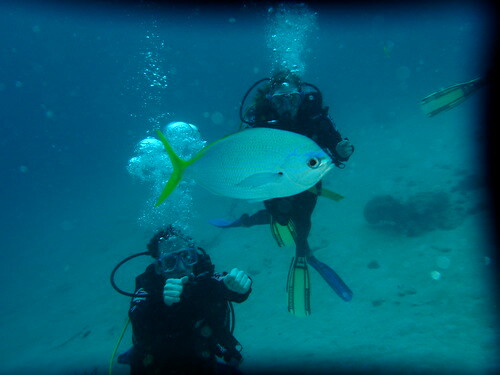 There was a school of glittering baitfis which are obviously used to divers. The commercial photographers that come down with groups bring food with them in order to get the fish into photos with divers. You can fool these same fish into thinking you have food by rubbing your fingers together, and they'll come over to investigate. Swimming past a rocky area, we saw some farmer damselfish. These chaps have marked out an area which they look after on the seabed, and if anyone enters that area they get irritated and try and chase you away. Ignoring the fact that they are harmless and pretty small, they do a good job of looking annoyed so we moved on whilst trying not to laugh. 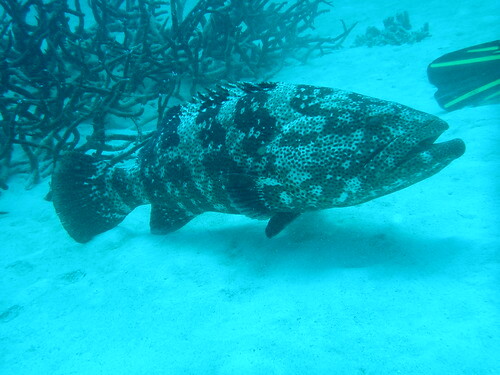 Malabar groupers and yellow-tailed fusiliers were also present, and we met a huge flowery cod known to the divemasters, which sits on the seabed looking exceptionally grumpy. He's used to people coming to have their photo taken next to him, which we did, although at one point he moved towards me fairly rapidly (perhaps thinking I had food) and after one look at his rows of needle-sharp teeth, I backed off sharpish. As well as this, we saw a flame file shell which is an amazing creature. Looking at it head-on, it appears to have electricity rippling across its surface. Then it was lunchtime. A decent cold buffet was on offer and I'd forgotten how hungry diving made me. 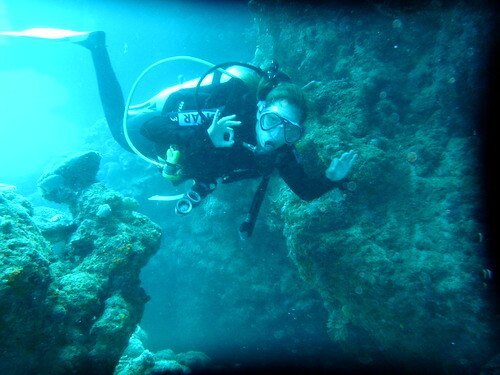 After stuffing various sandwiches, prawns and cakes into my face, I was ready for our final dive. Advanced Bommie was fairly decent, we saw a grey reef whaler shark (not to be confused with a whale shark - on every diver's "to see" list), some tomato clown fish, and an amazing school of batfish which we swam right into the middle of, and let them surround us. Was the reef dive worth doing? Possibly. I'd had better dives in Asia at a better price. If I was on my own, I probably would have skipped it. 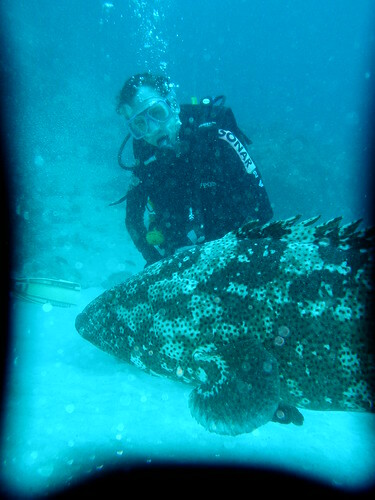 However, the chance to dive with good friends and have our own knowledgeable divemaster made it worthwhile (thanks Erin!). I didn't see anything hugely exciting, but it was good fun and if this is your first time diving then you'll probably get a lot from it. 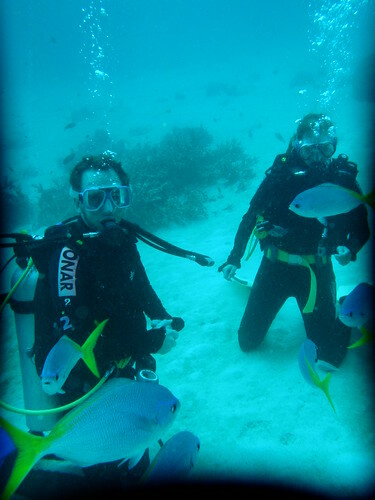 I think, like a lot of dive sites, the more you do it the more you'll see and enjoy - I guess this is why scuba diving instructors are always so enthusiastic! We were ready for a night out on the town after dinner. After getting the bus into the centre (well, it's basically one road of bars) we immediately hit a stumbling block after we realised that our passports were back at Tom and Erin's. Of course, this meant that the bouncers at the first bar asked for ID and refused to accept UK driving licences. Paul gallantly jumped onto a bus back to go and grab them (20 minutes each way) whilst we managed to get into the next bar along without any issue. Tom and Erin joined us shortly after and, invoking the Law of Sod, we ended up staying at this same bar for the rest of the night, negating the need for passports at all. Ah well, I guess Gilly can take heart that she looks under 18. Much beer, cider and sparkling wine was consumed and we got back at about 2:30am, utterly exhausted. what happens if you start coughing underwater? surely you'd drown! i don't see a way round it.